Rico, a cranky old monkey, was blessed with an abundance of bananas. So great was his selfishness that he failed to consider the needs of others even though he had more than enough to spare. But when tragedy befell Rico, he came to realize that his own careless and selfish ways were to blame. When the same animals he had turned away helped Rico he soon learned that performing small acts of kindness can bring great joy to others as well as to himself. 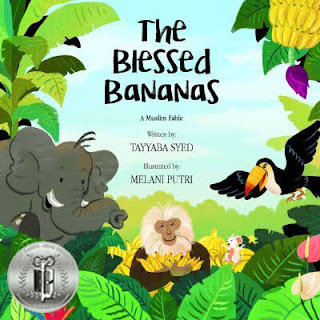 The Blessed Bananas, by Tayyaba Syed, is a lovely book with a powerful message about sharing and caring for others. Lovely illustrations by Melani Putri, help further enhance this book which is recommended for home and school libraries and has earned the Literary Classics Seal of Approval.